The Ford Transit Passenger Wagon is one of the most popular passenger wagons, hands down. It's equally viable for transporting groups during casual and formal outings. We here at Apple Ford Lincoln Apple Valley are huge fans of the Ford Transit Passenger Van's tech features, especially the two discussed below. Ford's Lane-Keeping Alert employs two high-tech tools to enhance safety when you're behind the wheel of the Ford Transit Passenger Wagon. A windshield-mounted camera monitors lane departure, causing the steering wheel to vibrate. The Driver Alert system includes audio and visual alerts in the event of unintended lane departure owing to tiredness. 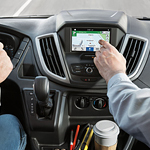 Sync 3 is like a virtual command center for hands-free operation inside and outside the Ford Transit Passenger Wagon. Sync 3 lets you control compatible mobile apps while offering navigation and shopping support via integrated Waze and Amazon Alexa. However, it's Sync 3's Connect Hotspot that excites us most, boasting Wi-Fi hotspot capability inside the Ford Transit Passenger Wagon cabin. See for yourself with a test drive as soon as possible.